Are you looking for power backup when your laptop, smartphone, or tablet runs out of energy? If you are constantly on the move or regularly perform activities such as camping, hiking, trekking, and more, then you need a portable source of energy. The best choice for that is to opt for a solar power bank! 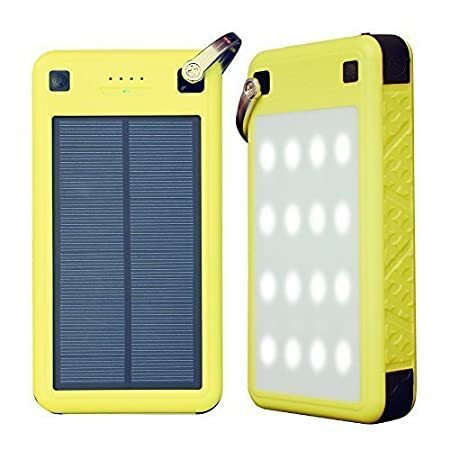 Here in this article, you will find some of the best solar power banks of 2019. Moreover, you will also find valuable tips on making an accurate choice for your needs. You’ll also learn about charging times, compatibility with cell phones, and much more. After reading this short article you will learn everything you need to know before purchasing a solar power bank. Are you ready? Then let’s get started with the most valuable products available! The Beartwo 10,000 mAh ultra-compact external battery with dual USB ports is one of the lightest, economically smart, and most reliable solar chargers in the market. The product only weighs 7.4oz and can provide power to your smartphones by simply paying $25. This makes it an ideal solar power bank for cell phones. Given the purpose of this portable solar charger, it can be easily hung onto your backpack, which makes it perfect for a camping trip, hiking, and many other outdoor activities. The amazing feature of the dual USB port is great because it is able to charge up to two devices at the same time, at a maximum output of up to 5V/2.1A using the smart IC technology to detect the device and charge at optimum speed. The best thing about this simple but efficient solar power bank charger is that it only takes between 4 and 5 hours to get charged using its 5V/2.1A USB port. Every single USB port is usually covered by an IP67 rubber cap that protects your battery from complete immersion 1 meter under water and that deeply protects it against dust. Hiluckey is a high-tech company that focuses on promoting multiple solar power products such as solar chargers, LED flashlights, pumps and much more. In this occasion, the Hiluckey portable solar charger and 24000mAh power bank offers an efficient solution of the size of a smartphone that can easily fit into your pocket. When unfolding the product, you will have three solar panels available to charge your power bank much faster than other models. The solar power bank has a 24,000mAh battery capacity based on high-efficiency lithium polymer technology. This allows the power bank to charge your phone and other electronic devices as well. 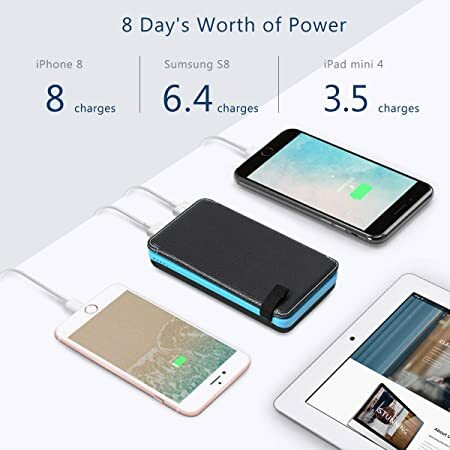 Actually, you may be able to charge your iPhone and Samsung between 8-10 times, while you also have the ability to charge your iPad and Kindle up to 4 times as well. This makes it an attractive solar power bank for the iPhone. Another interesting feature is that this product has waterproof protection on its dual USB ports that offer a 2.1 A high charging speed on both USB ports. Moreover, the device is integrated with overcurrent, overvoltage, and short circuit protection which adds a remarkable value to the product. ZeroLemon is the shop for portable and external battery solutions to charge multiple devices. Despite that their main market is not related to solar energy, they have promoted this new ZeroLemon 26800mAh SolarJuice portable solar battery as a remarkable solution for the outdoor market. The product has a beautiful lemon cover that protects a high capacity solar power bank against shocks or damages. Moreover, its compact size maximizes portability to easily fit in your camping and hiking backpack. If there is not enough space inside your backpack you can also use the hook that is integrated with the portable solar charger to on the external section of the backpack. One of my favorite features of this product is that it has multiple USB outputs. One of them is the type C 5V/2.4A port, suitable for smartphones such as the Huawei P9, the LG Nexus 5X or HTC 10. There is also the 5V/2A micro USB input, the traditional USB2.0 output and the ultimate quick charge 3.0 output, which has a quick charging capability. All of these ports allow the ZeroLemon product to charge up to three devices at the same time. When evaluating this, the integration with LED flashlights, compact size, large battery capacity, and beautiful aesthetic design, then we can consider this ZeroLemon as a true top solar power bank. Power bank capacity 26800mAh/97.28 Wh. 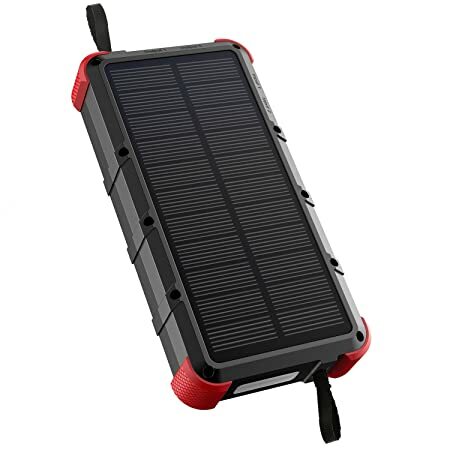 The Nekteck 10000mAh travel solar power bank with 10000mAh capacity is a remarkable product designed with a lithium polymer battery technology to maximize outdoor experiences. The most amazing thing about Nekteck is that the portable solar charger is integrated with SunPower’s high-efficiency solar panels that reach between 21-24% efficiency under direct sunlight conditions. This reliable solar power bank is guaranteed to last over 1000 recharge cycles with anti-explosion protection under fast charging scenarios based on its lithium polymer technology. Moreover, you do not need to worry about taking it out to the outdoors because the cover of the power bank is water-resistant, dust-resistant, and is guaranteed to protect the lithium battery against shocks or dust as well. It is also a cheap solar power bank, therefore, if you are looking for a simple, but effective solution to cover your energy needs while being off-grid, then Nekteck is a great option for you. Easy to carry, dynamic, tough, durable. That’s the Soluser 25000mAh portable solar power bank. Integrating a built-in dual LED light with 3 modes of operation such as steady light, SOS and stroboscopic modes. This led light can be used as a torch or as a signal for help on emergency situations. Safety is most important as well at the moment to charge your device. Therefore, a reliable solar power bank should provide protection for your electronics. This is possible in the Soluser product thanks to the intelligent protection system that effectively protects your smartphones, iPads, or laptops from any overcharging, overcurrent, or short circuits as well. 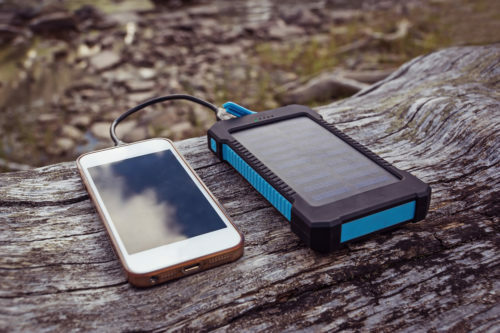 This mini solar power bank offers up to 25000mAh of capacity to provide long endurance on camping and road trips as well and is compatible with multiple electronic devices. Like other similar products, the Soluser also includes 4 LED indicators to assist you in emergency situations. Another important solar product for camping is the Hobest 10000mAh solar power bank. This water-resistant product has two main charging methods. One of them uses a direct 5V/2A input that can be connected to a power outlet to save time by increasing the charging speed. The other one uses a free energy resource as it is solar energy. Moreover, the Hobest 10000mAh power bank has the ability to support two rechargers for the Galaxy S6, and its dual USB output allows it to charge two devices simultaneously. 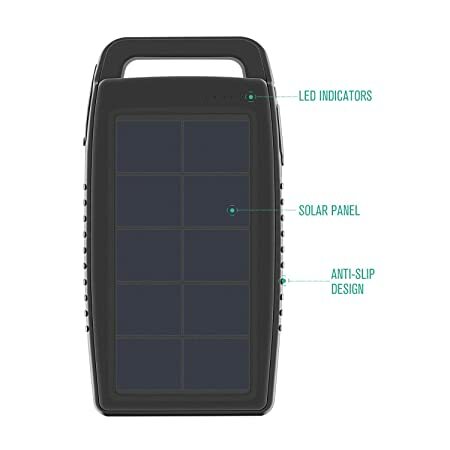 An interesting feature of this high-quality solar power bank is that includes a compass whistle to use it when no GPS or Google Maps is available in the outdoors; mainly for emergency situations. As part of this survival device, the power bank also integrates a built-in LED flashlight that has three modes of operation in the dark. 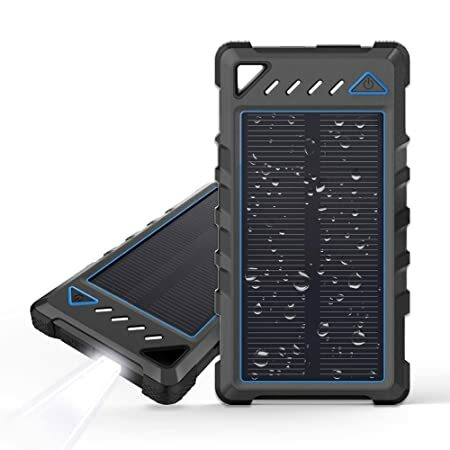 The product has also included smart IC technology for its USB ports and has a short circuit and over-discharging protection as well, making it the perfect cell phone solar power bank. Integrated with the IP67 waterproof and dust protection, it is also a military-grade design that protects against shocks, bumps, or even rocks. Unique 4A dual USB ports are included as part of the design, along with a type C and Micro USB ports as well that allow fast charging in 6 hours. A bright LED light is also included as part of the device and taking into account the large capacity of the power bank it is advisable to use a power outlet to increase the charging speed of the power bank. When going to purchase a portable solar power bank, there are many questions that may arise as you check on the products. If you have any doubts about which factors you should take into account when choosing one of these products, then you will find these tips very useful. Maybe the most important factor of any solar power bank is the capacity that the lithium battery has. The battery capacity represents the amount of energy that can be stored inside the backup battery and is generally expressed using mAh or Wh units. A portable solar power bank could have as low as 2000mAh of battery capacity which could be enough to charge your device (probably a single charge of a cellphone), this can be classified as a small solar power bank. On the other hand, the device could also have as much energy capacity as 50000mAh which could be enough to charge tablets, charge your smartphone or laptop several times. This can be classified it as a large solar power bank. As you can presume, cost and also weight vary according to these facts. Therefore, you must select the solar power bank taking into account the purpose for which you are going to use it. If you are going to use this external battery for your daily life on the city or town and you simply want to have a backup battery in case you run out of power, then you will probably only need a simple 2000mAh portable solar power bank. 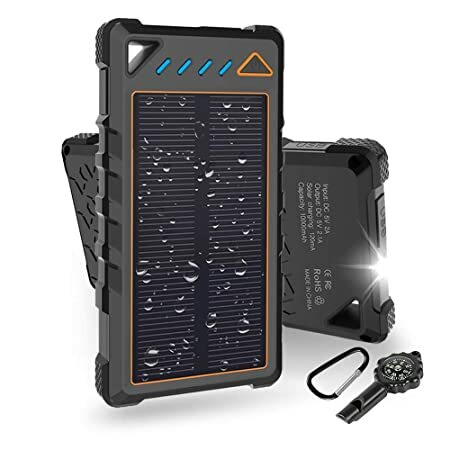 However, if you are looking to have a backup battery that lasts for days while being off-grid on a camping trip or when going hiking, then you will need a larger solar power bank with capacities between 10000-50000mAh depending on the number of days. Also, remember that a large capacity always demands more time to charge completely. The main idea of a portable solar power bank is to provide a reliable power source while being off-grid, but without representing any important sacrifice in the process of carrying the device from one place to another. Top portable solar chargers should take this fact into account and offer the small, lightweight, and easy to carry solution. If you are evaluating several options, then consider which ones are foldable, which power bank includes a steel loop to hang it on the backpack while you walk (it’s crucial to take advantage of the time to charge the battery while you walk), and which one is smaller. The main purpose of choosing a solar power bank battery charger is that it charges the battery using the Sun’s energy without depending merely on power from the grid. Since the main source of power here is the solar panel, it is crucial to examine the quality of the solar cells. Efficiency is the most important factor here. If efficiency is low, the device will need larger portable solar panels and much more time to get the battery fully charged, which impacts portability. No other brand in the world offers a better efficiency for solar cells than SunPower. Therefore, if you have to choose between a solar charger power bank with SunPower solar panels and another product that is less expensive but that uses unknown solar panels, the best choice is to go with the SunPower one. · How Many Available USB charging Ports Does the Solar Power Bank Have? One of the greatest features a power bank can have is to be able to charge multiple devices at the same time. Most power banks will have dual USB ports. However, you will find some that may have three USB ports included of different types and for different devices. This is very useful as it means that within the same time range you could charge your laptop, your smartphone, and your iPad. If the solar power bank you are evaluating, only has a single USB port, then it is not worth it. As usual, the extra feature that the manufacturer wants to add to the power bank always balances the equation. Features such as LED indicators, LED light modes of operation, steel loops for hanging, aesthetic design, Quick Charge 3.0 USB ports, and included accessories such as a USB cable or an adapter are always factors that could help you take a decision. How Much Should I Expect to Pay for a Top Solar Power Bank? As we mentioned before, the price will be directly related to the battery capacity, but also to the solar panel technology and the brand. 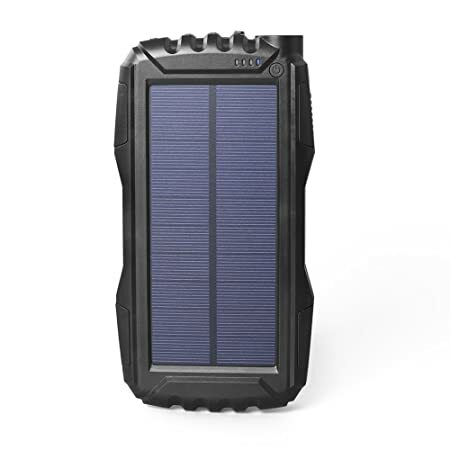 A good quality solar power bank should never cost more than 60 USD. Price ranges for power banks with capacities between 10000mAh and 20000mAh should be located between 20USD and 30 USD. Over 20000mAh you could expect prices to rise to 40-50USD. The possibility to charge an electronic device or not will depend on the USB port type of the solar power bank. Most products have a universal USB output, but some have micro-USB or type C charging ports. In any case, you can always look for an adapter to connect your phone. iPhone X, 8 7, 6. Every smartphone has a lithium-ion battery that you can check on the specs of your phone. All you need to do to verify whether or not your solar power bank is suitable to charge your phone. First, check the battery capacity of the smartphone in mAh. Then, divide the battery capacity of the power bank when its fully charged by the energy needed by the smartphone. You will then will find the number of times that the power bank can charge your phone. Also, take into account the type of charging ports that the smartphone needs and see if the USB solar power bank includes it. If not, simply purchase an additional adapter. Another fact that you could take into account, which is not limiting but worth knowing, are the amperes that your cell phone needs to charge. Universal USB outputs have a 2A output, however, you may find some with 2.1 A, 2.4A or even 3A. This will influence the charging speed of the mobile phones, but could also impact the performance of the battery since cell phones are designed with a specific nominal electric current. Check the battery specs of your smartphone to see if the nominal electric current demanded is lower or higher than the one of the USB port, if it is lower, then there is no problem, the power bank will only provide the current that the phone needs. But, if it’s higher, consider looking for another power bank. Roughly How Long Does a Full Charge Last? The answer to this question varies from user to user, from power bank to power bank, and from smartphone to smartphone. Basically, the battery capacity determines how long the fully charged power bank will last. 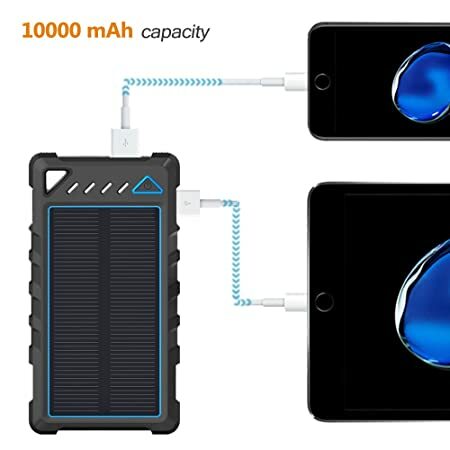 As an average range to take into account, a fully-charged 24000mAh solar power bank should be able to charge an iPhone or a Samsung phone at least 8-10 times. Considering that the battery of a smartphone should last at least 1 day under continuous use, then we can say that the solar power bank should last around 1 week. However, if you use the external battery to charge multiple devices, then the charger won’t last as long. 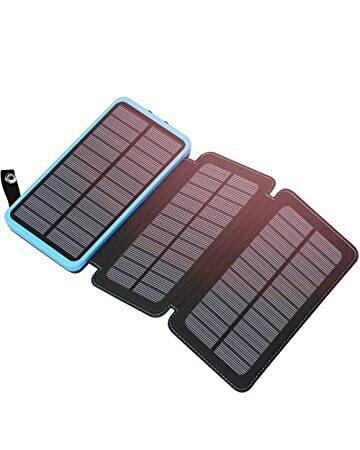 Consider if you are looking for a solar power bank for laptop or if what you want is a cell phone solar power bank. This will influence the decision of the battery capacity. Roughly How Long Does a Full Charge Take? As with the previous statement, the battery capacity determines the charging capability. Solar power is a source of energy that varies according to climatological conditions. Therefore, establishing charging times is not an easy task. However, based on recommendations from manufacturers, we can establish some charging range. For instance, for a 20000mAh power bank, requires between 60-70 hours to charge (around 3 days) only using solar energy as a primary resource. Remember that 5V is related to the voltage at which the battery gets charged and 0.8 is a factor referred to losses in solar energy into electrical conversion. If you have access to a power outlet, use it. You could end up reducing charging times by 5-6 hours. Before taking any trip, fully charge your solar power bank by plugging it into an outlet, and use solar energy as a constant recharge source while you are outdoors.